I have a mental checklist of musicians I would like to see in concert at least once in my life. 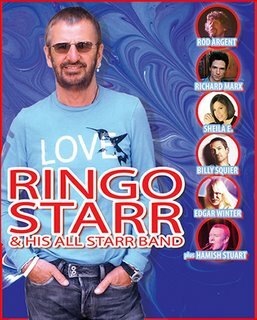 Last night, I got to check one off the list, as I went to see Ringo Starr and his latest version of the All-Starr Band. The whole idea of the All-Starr Band is brilliant. Much as I love Richard Starkey, MBE, I have to admit that it would be tough for him to carry a full-length concert on his own. He has always functioned best as just one Starr in a constellation. So, when he finally decided back in 1989 to give touring a go for the first time since the 1966 Beatles, he assembled a group of well-known friends like Clarence Clemons, Dr. John, and Billy Preston to join the band. He must have enjoyed the experience, since he's undertaken a new All-Starr Band tour every two years or so, inviting a new group each time. This year marks the ninth tour. The All-Starr Band concert format is simple. Ringo starts out up front with a microphone, singing a couple of instantly recognizable hits. There is always a second drummer on the tour to keep Ringo free to play or not as the moment demands. After a bit, he retreats to his drumkit, and allows each of the All-Starrs to take a turn in the spotlight. Unlike most "host of special guests" concerts, however, everyone stays on stage and plays everyone else's songs. The resulting chemistry among the unlikely pairings is what gives these concerts their undeniable appeal. This year's model features: 1980s MTV icons Billy Squier and Richard Marx as the guitarists, with Billy taking most of the leads; a somewhat older pair of icons, Edgar Winter and Rod Argent, on keyboards; third-time All-Starr Sheila E on drums, and the ever-reliable Hamish Stuart from the Average White Band on bass. That's it, brother -- no back-up band, extra synth players, taped backing, nothing. Every player in this band has had a Top 40 single at some point. And the thing that really struck me about this show is how much these folks enjoyed playing with each other. Billy Squier playing the lead on Marx's "Should've known better", Ringo and Sheila giving Rod a rock-solid foundation for his lead organ on "Hold your head up", and the whole band's incredible interpretation of Edgar's instrumental "Frankenstein" (the fact that a ferocious lightning storm blew through during the song didn't hurt the atmosphere) -- the pleasure that the band took in each others' talents could not help but please the audience as well. Of course, having Ringo as the Grand Old Man, reveling in the accomplishments of the rest, is the perfect touch. Still the same wise-cracking, ad-libbing Liverpudlian that he's always been -- during the storm, he asked if anyone in the band knew the chords to "Rain" -- he knows that the audience now looks to him as old Uncle Ringo, a living connection to All Those Years Ago, and he comfortably plays along. As Ringo remarked before the band broke into "Yellow Submarine", "If you don't know the words to this one, you don't know why you're here." Well, we all knew, and we all sang, and a splendid time was guaranteed for all.